half of all Illinois counties have approved such plans. Most school finance questions fared well in the March 20 primary, as unofficial school referendum results show voters approved two of four local tax increase questions, ten of 14 building bond propositions, and two of four county sales tax plans. One tax hike won approval in West Carrol CUSD 314, a 5-cent increase per $100 of equalized assessed valuation in their education fund. Another tax increase was approved in Mt. Prospect SD 57, with voters approving Property Tax Extension Limitation Law (PTELL) ceiling increases that should raise 5.7 million additional dollars for the district’s education fund. Voters failed, however, to pass a tax referendum in Limestone CHSD SD 310, a proposal that fell just 177 votes short (1,279-1,456). But a tax plan failed by an overwhelming margin (97-469) in West Lincoln-Broadwell Elementary SD 92, where the district had proposed to increase funds under the Property Tax Extension Limitation Law (PTELL). Of the countywide sales tax increase proposals earmarked for school facility purposes, voters approved only two of four, in Richland, and Woodford counties. Two sales tax propositions were decided by narrow margins, with a 274-vote margin of victory (2,266-1,992) in Richland County, and a 639-vote margin of defeat (4,464-5,103) in Vermilion County. Meanwhile voters adopted a countywide sales tax for school facilities in Woodford County (4,523-3,389), but defeated such a sales tax in Madison County (14,966-27,523). All four proposals called for a one-percent increase in the sales tax, all of it earmarked for school facility purposes. 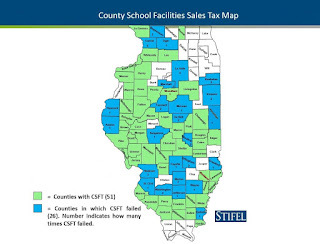 To date, 51 counties have adopted a sales tax to benefit school facilities, half of the state’s 102 counties. In other election-day action on school questions, voters rejected the lone school consolidation plan by a vote of 564 to 810. The plan was to combine Palestine CUSD 3 and Hutsonville CUSD 1. The proposition passed in the Hutsonville district by a vote of 372 to 116, but it failed in Palestine by a vote of 192 to 694.